Reveal your secrets to the forest, and your love will echo between the trees forever. 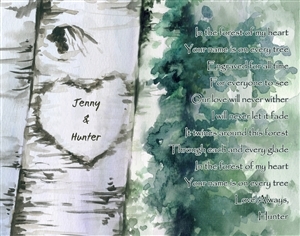 Show your everlasting love to that special someone with this personalized ink rendering print! A myDaVinci exclusive as always. Made a great anniversary present! Very pleased with the quality of the artwork. The canvas came just as requested. Double wrapped and secure shipping. Very happy and highly recommend.